The weekend is around the corner, with a lot of events lined up, and you might just be cracking your head over the best treat to give to your guest. The great and tasty Asun got you covered all the way. Hold on a bit because you probably want to ask what in heaven’s name is Asun? Here it goes. 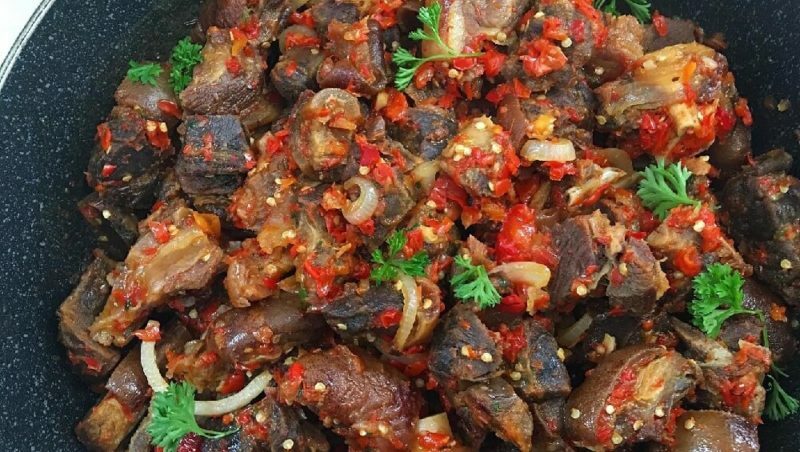 Asun is a grilled spicy assorted goat meat well known amongst the Yoruba’s. It is usually served at almost every Owambe(party) as an appetizer alongside other finger food. So, if you’re a big fan of asun, you want to surprise your friends and loved ones with unusual small chops in your event, I will advise you follow the steps below. Salt and stock cubes to taste. Pepper (quantity of pepper is dependent on individual taste). ½ cup of cooking oil. Wash the goat meat thoroughly and marinate with the stock cube, salt, vinegar, thyme, Benny, curry and the onions mixture. Cook the goat meat till its tender, then chop into your desired size and grill using the oven or a barbecue stand for few minutes till it is a bit dry. Heat up oil in a pot pour in ground pepper, and sauce it. Now you can pour in the grilled goat meat, chopped bell pepper, and stir-fry for 5min on medium heat. Your delicious Asun is ready!!! Serve and enjoy with a glass of juice or wine.